Looking for idea’s on how to securely attach some 1in walnut I’m about to make to the edge of a bowling alley table I’ve been working on. The sides aren’t 100% flat, and I can’t make them due to nails here and there down the side. I’ve grinded them back, and recut the ends to be as flush as possible. Just slap some glue on the side and clamp it down as tightly as possible. 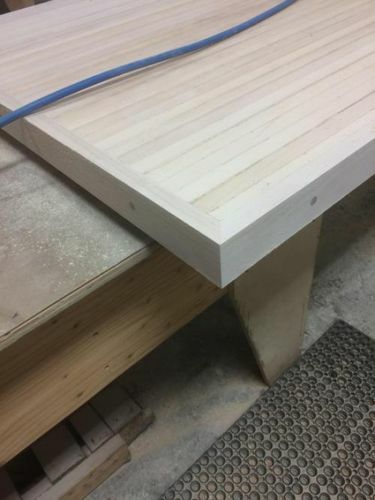 Drill some holes and attach with screws, placing some dowels over it and flush cutting…. 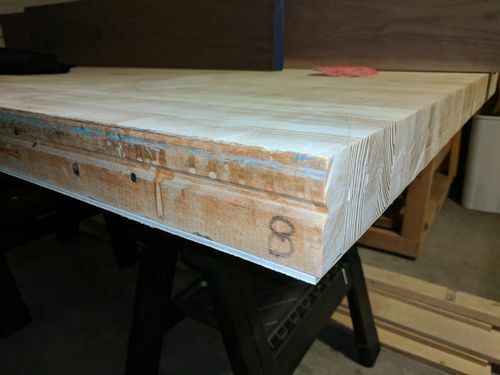 What’s the best way to attach a 1in x 2.5in boarder to a table top that’s sides aren’t perfect and will be the cleanest looking. Album if you need photo’s to reference. Apply your edge as straight and square as possible. Set router fence with 1/8” (go 1/4” if you have larger gaps) spiral and center over seam of field & edge. Route a dado/groove over the seam 1/8” deep. Mill walnut stock to fit groove width and thicker/depth than dado. glue inlay into dado, let dry, flush inlay to top with planer sand & finish. Are you saying you want to attach a 1” thick 2- 1/2 ” walnut border around the table? If it was my table, I’d run through several inexpensive circular saw blades and cut the sides square. Cut right through the nails. yes, I’m looking to mill the walnut to be 1in thick, 2.5 in high (match table depth) and the lengths to size. 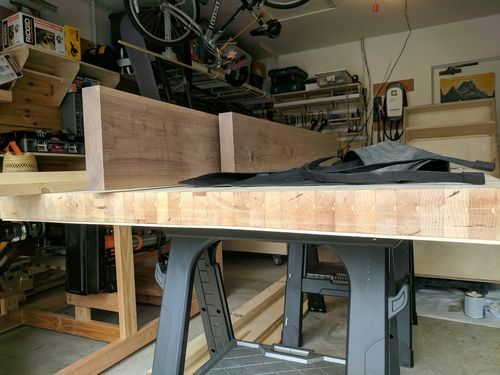 My initial thought was to use a forstner bit to attach it with some small screws/bolts an then use a plug to cover it… thinking about it more, wanting it to look good, I wasn’t sure if there were other ways to attach to the side of the table. 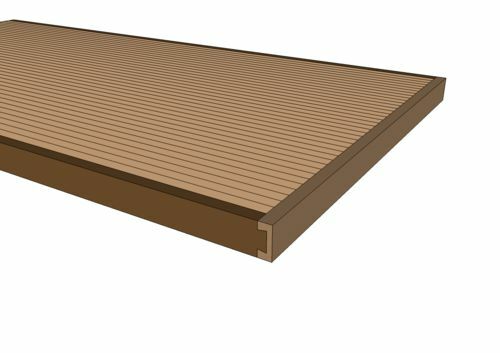 Attached is an image of one side that had a dado in it, there other is completely flat. Straight glue for something that will be used for years, didn’t seem strong enough or lasting, though I’ve seen some very old butcher blocks only held with glue. Assuming I can square up the sides to match at a 45, or cut them to fit if they are off a little. If you are planning to run a walnut strip around all four edges, mitered at the corners—- DON’T DO IT! If you must have the edging, a breadboard end would serve better. If you are planning to run a walnut strip around all four edges, mitered at the corners—- DON T DO IT! That is why I was asking all the questions. I what to make sure I knew what he was doing exactly. The bowling alley piece could expand and contract in it width and ruin your work. would someone be willing to draw a napkin sketch of how this would work? Attaching another photo after reading that article. The movement would still occur even if it’s glued well in place ? thank you for the photo… so for the orange end blocks and the end piece with the dovetail, no glue holds on the end pieces? just the friction holds them together? Right. I’ts a mechanical connection, no glue. The table will expand and contract with seasonal humidity changes. The joints at the corners will not always be flush—so expect that (and make sure the client expects that). This is for personal use. 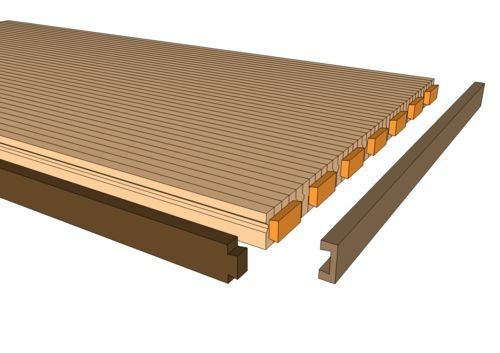 Ok any other resources or articles on this type of joinery? Jack—How many seasonal humidity changes has your table been through since you added the mitered trim? What kind of climate does the table live in? 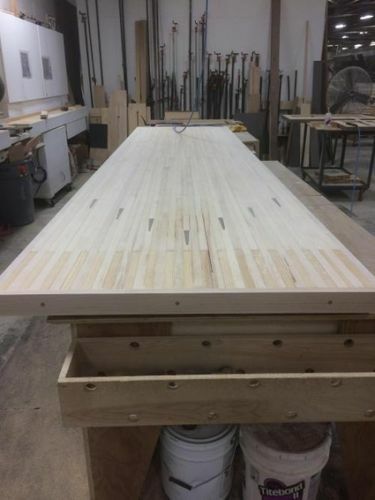 A “bowling alley table” is somewhat different from a “traditional” table in that the individual pieces that make up the top are not glued together—only nailed. This does allow the individual pieces to expand and contract individually (potentially creating tiny gaps between individual pieces)—so the risk of creating a Panel of Doom is somewhat less. Is it enough? Personally, I would not risk it, but I have never built a Bowling Alley table—only “traditional” tables. Anybody else have actual experience with bowling alley tables? Do they move as much as a normal table? This article (no I didn’t read it in its entirety ) talks about bowling alley lanes expansion and contraction.